Shadowhunters is back! We've been in a serious withdrawal without some of our favorite supernatural characters on our TV screen. Let's get this out of the way: I love the new look and feel of the show! On Shadowhunters Season 2 Episode 1, we got to see all the new changes and updates added in after the first season. It's still the fun show you love, but it's more mature and darker. When we chatted with Shadowhunters execs Todd Slavkin and David Swimmer, they mentioned the tone would become darker and grittier to suit a new direction. The blades have been one of the points that took away from the seriousness of the show. The design didn't fit in. And now with a more polished and realistic look to them, the fight scenes have an added layer of real tension to it. I couldn't be happier. To complement the tone and look, the opening theme is new as well. The music has slowed down and it highlights the cast. While I do still like the first season opener, I find this one suits the direction so much better. And it shows off the unique qualities of the group, like Alec with his bow and Simon as a vampire. Though, even with the new vibe, I'm so happy they still kept the jokes and cheekiness, like with Magnus. I need a weekly dose of Shadowhunters one-liners and quips! Magnus: You really don't get it, do you? You didn't risk anything for me, you did it for you. Alec: What? Are you seriously doing this right now? Right now?! 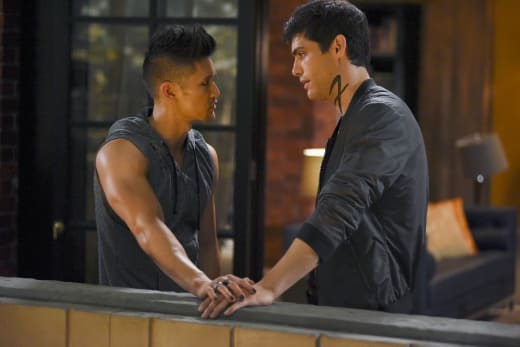 Alec: Then what do you want from me?! Permalink: You really don't get it, do you? You didn't risk anything for me, you did it for you. Good for Magnus for standing his ground! It's great to see their relationship start to mature right in the first episode. They have to be a team. And after the risk at the wedding on Shadowhunters Season 1 Episode 12, Alec could've kept using that move as a bad crutch if he wasn't put in his place. But it all worked out! Malec lives on, and this ship is still sailing. Another relationship that is popping up again is the unrequited crush of Clary from Simon. It's clear she will never like him that way. I know it. You know it. The entire supernatural world on Shadowhunters knows this. But does anyone hope they'll happen? This pairing seems like a long shot and it's not one I could see work. I do want their friendship to stay in tact if he does reveal the truth (the FULL truth) to her. This has a way of ruining friendships. But we'll find out soon enough since he was close to telling her – he just needs a few more pep talks with Luke. Simon: So do you think it's true? What they're saying about Jace? Luke: That he's working with Valentine? I don't think so. Simon: I mean, he could come for Clary next. He's totally hung up on her. Luke: So are you worried about Jace...or maybe telling Clary how you feel? Be bold, Simon. If only Simon's powers could grow along with him. His failed attempt at magic was hilarious! He looked utterly shocked to find out that a baby vampire couldn't muster the energy to control experienced werewolves. It's interesting to see how his powers could progress. 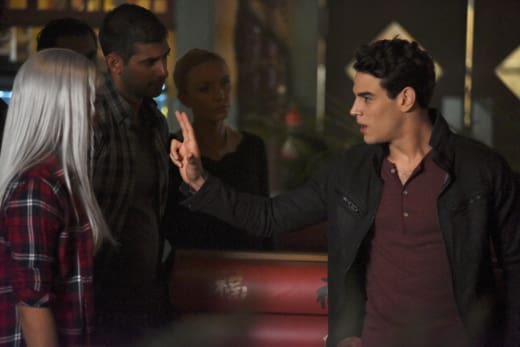 Simon, just like Clary, is new to this world, and she's already developing her fighting abilities and knowledge of runes. What magic could he perform? Gretel: We know Luke said you could crash here. But not here! Simon: You don't want to touch me. Encanto! Gretel: What the hell are you doing? Simon: Encanto. Ummm...Encanto! It's supposed to make you do whatever I tell you to. Gretel: You're the worst vampire ever. Permalink: You're the worst vampire ever. Everything about the training scene with Isabelle and Clary might be my favorite moment of the episode. The pacing, the fight choreography, and the dialogue between the friends fit together for a fun scene. The fact that Aldertree was sitting in the next room while they quoted Sun Tzu was the perfect touch! Clary and Isabelle have such great chemistry together. Their friendship is one of the more understated pairings on the show. Emeraude Toubia and Katherine McNamara (Izzy and Clary, respectively) pulled this off – we need more scenes of them together. Isabelle: Did you study "The Art of War"? Clary: It's not on the reading list at art school. Isabelle: You should learn it. Sun Tzu gives excellent advice. Isabelle: "Move swift as the wind, and closely formed as the wood. Attacks like fire." But my favorite: "To know your enemy, you must become your enemy." Permalink: It's not on the reading list at art school. The same goes for Jace and Valentine. You can feel the tension when these two are together, especially the scene in the kitchen. Jace clearly hates Valentine with every fiber of his being. The added angles (like the one through the window) covering the conversation added plenty of tension to their already strained relationship. Kudos to the editor and director for picking those shots. Also, we have to take a moment to talk about the ship. The terrifying reality of Jace's capture is perfectly summed up in that creepy prison with the Underworlders. That place looked dirty, dangerous and a scary place to be. We can't forget that Valentine, even with his charm and intent, is still a monster. But the scene with Valentine forcing the warlock's head through the ship's barrier is one I may always remember. The special effects this season have vastly improved! (Well done, Shadowhunters team.) The show is really going there with showing the extent of danger. I don't know what the effects of Jace's demon blood will mean for his future or friendships. The vampire Maria mentioned he was stronger than most Shadowhunters, but is this a "tip of the iceberg" type scenario? Could he have more powers than we even know? We need to know which demon blood is currently in his veins! That is to say if Jace is really Jonathan (Clary's brother). 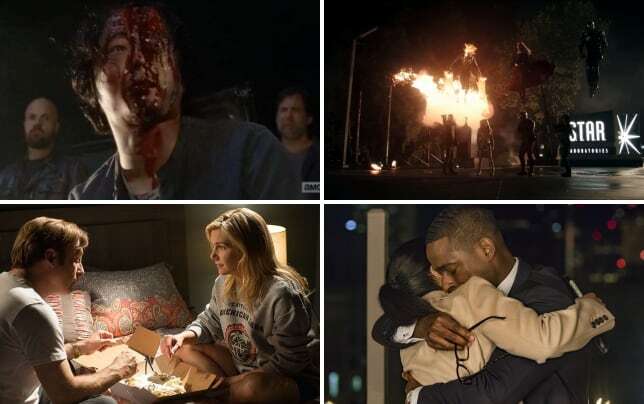 Valentine is untrustworthy while Jocelyn saw her son burn to death. I'm interested to see where the show goes with this debate because Shadowhunters on Freeform is different than the book series – anything could happen! And I love when twists keep me on my toes. What did you think of "This Guilty Blood"? 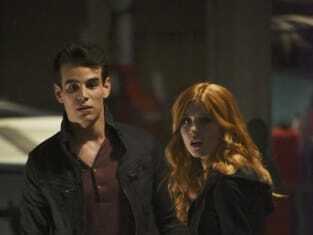 Will Clary reunite with Jace? Will Simon develop powers as a vampire? Is Valentine or Jocelyn hiding more secrets about Jonathan? 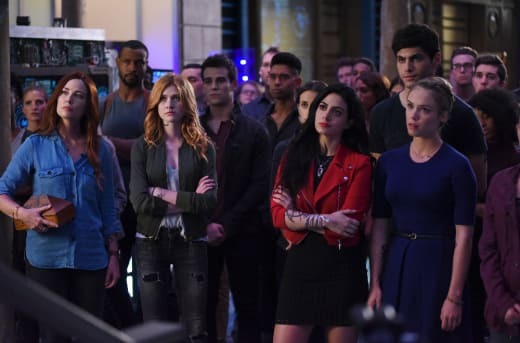 If you missed the season premiere of Shadowhunters, you can watch Shadowhunters online via TV Fanatic. Come back to let us know what you think.